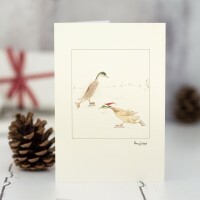 We offer a discount on any of our Christmas card designs. 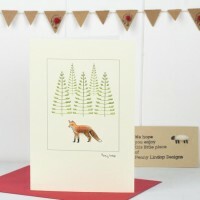 Look for the pack size buttons below the description. 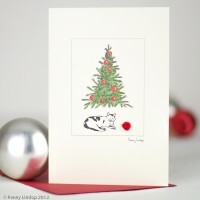 A beautiful handmade cat & tree Christmas card, perfect for all cat lovers. The cat is lying ben.. 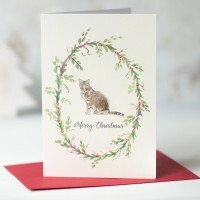 This cat and wreath Christmas card is sure to be admired by all cat lovers. 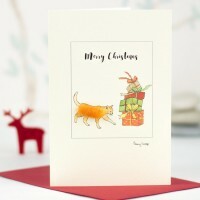 The tabby cat is pl..
Our cat Christmas card with ginger cat is the perfect card to send to any of your cat loving friends.. 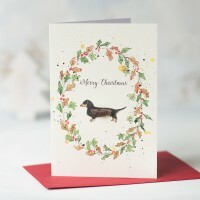 This very elegant dachsund and wreath Christmas card is a must for dachshund owners. 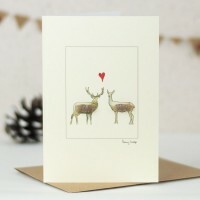 We have pu..
Our deer in love card is charming with it's 2 deer looking at each other. 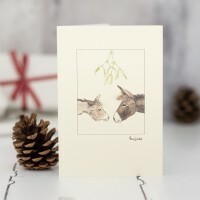 I love you dear, this..
Our donkey Christmas card with 2 donkeys beneath some mistletoe is the perfect card to send to ..
Our ducks skating Christmas card celebrates the fun times of the Christmas season. Ice skating India.. 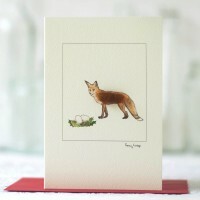 This is our beautiful handmade fox and eggs Christmas card. 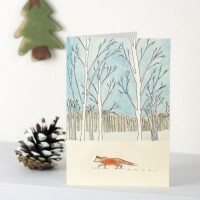 It features a fox keeping an eye on a ne..
A beautiful handmade fox Christmas card with a fluffy fox and a line of stylised wintery trees ..
A beautiful handmade gnome Christmas card. 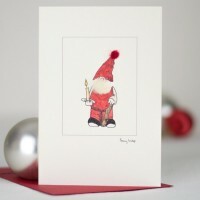 We hand finish his fluffy beard with a puff of real sheep.. 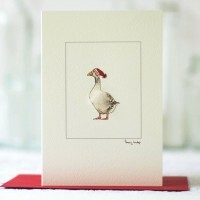 This is our delightful goose & hat Christmas card with an adorable goose in a warm woolly h.. This hedgehog and wreath Christmas card is one for animal lovers. 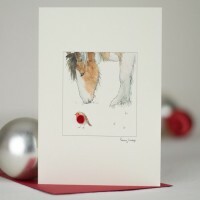 The gorgeous little endangere..
Our beautiful handmade horse & robin Christmas card. 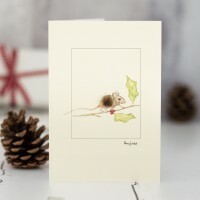 It features a friendly horse and his cute l..
Our mouse Christmas card celebrates the delightful little harvest mouse as he clambers across a holl.. 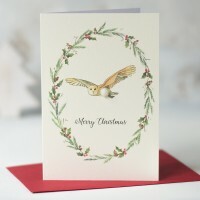 This owl and wreath Christmas card is one for animal lovers. 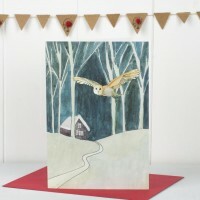 The owl is placed within a festive..
A beautiful handmade owl Christmas card. 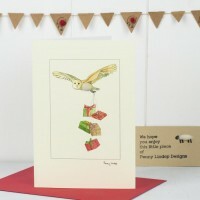 This busy little owl is out delivering Christmas presents. 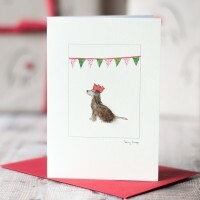 ..
Our party dog Christmas card will be a delightful card for all dog lovers. 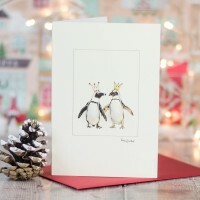 He's so excited that it's..
Our penguin Christmas card is perfect for any penguin lover . 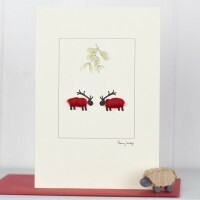 These are African or Jackass peng..
Our 2 woolly reindeer beneath mistletoe Christmas card is perfect as Chris..
Our reindeer & stocking Christmas card will raise a smile. 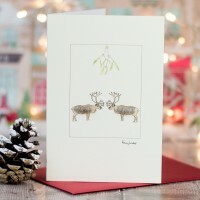 Who doesn't associate reindeers with .. 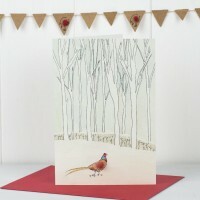 This is one of our classic Christmas card designs. 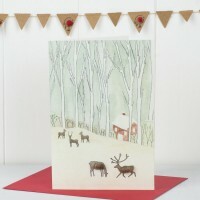 In our reindeer sheep Christmas card, our 2..
Christmas would not be Christmas without one of our fluffy little robins. 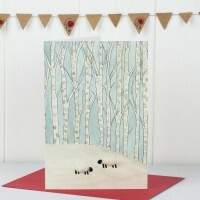 Our delightful handmade ro.. 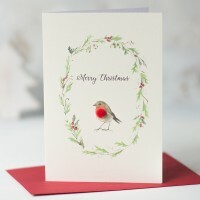 This very elegant robin and wreath Christmas card will delight all who love robins. 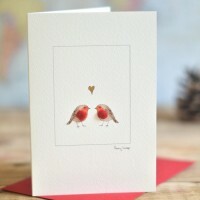 We have put.. 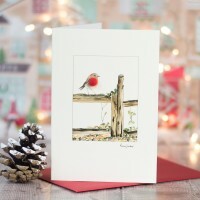 In our beautiful handmade robin Christmas card the robin sitting on a fence thinking of Christmas. 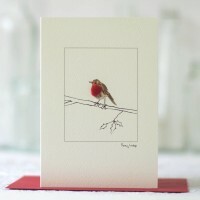 ..
Our robin on a mantlepiece is a perfect card to send to any friends who love the little robin. 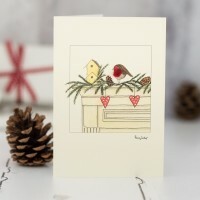 This ..
Our beautiful handmade robin & heart Christmas card. 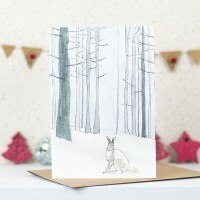 Our card features two robins with a hand dr..
Look no further than our Scandi winter woodland Arctic hare Christmas card if you are looking for a ..
Look no further than our Scandi winter woodland fox Christmas card if you are looking for a stunning..
Look no further than our Scandi winter woodland Owl Christmas card if you are looking for a stunning..
Look no further than our Scandi winter woodland Pheasant Christmas card if you are looking for a stu..
Look no further than our Scandi winter woodland sheep Christmas card if you are looking for a stunni..
Look no further than our Scandi winter woodland reindeer Christmas card if you are looking for a stu.. This sheep and wreath Christmas card is an elegant design for any animal lover. 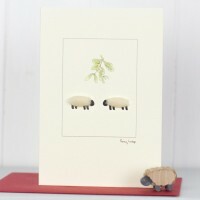 The woolly shee..
Our 2 woolly sheep beneath mistletoe Christmas card is one of our classic designs,. 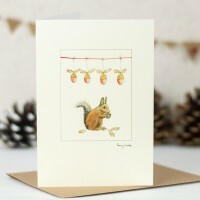 Christmas w..
Our squirrel Christmas card is charming, we think. 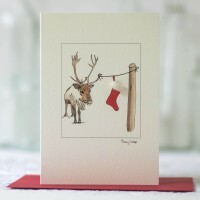 With his little fluffy woolly body, he sits.. 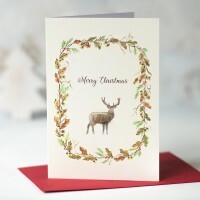 Choose this very festive stag and wreath Christmas card for any friend who loves the countrysid.. 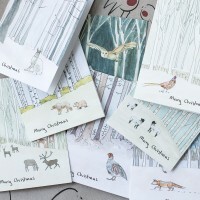 These winter Woodland Christmas Cards - Boxed Set of 8 - were inspired by the winter woodlands of Sc..